This wasn’t modern, sanitised bike racing, designed to dovetail nicely with commercial breaks and the burnished fictional sheen of public relations. It was a 152-kilometre bar brawl of a race. A gritty, agonising, mudstained throwback to another era. Romance, heart, attacking enterprise and panache, for once, won out against control and the smothering tactics of modern cycling. Science, numbers, control, technology, logic… your boys took a hell of a beating. The Tour de France peloton was broken into pieces over the monstrous, misshapen cobblestones of northern France, which the Tour borrowed from Paris-Roubaix for the day. Also irrevocably broken: the hopes of many riders, general classification and stage hunters alike. Chris Froome’s Tour is over – his second crash of the day, and third in two days, left him physically and psychologically battered, and he simply climbed into the Sky team car, rather than face more punishment. Alberto Contador, who might have breathed a sigh of relief that his main rival was out of the race, now faces a deficit of 2-37 on Vincenzo Nibali, a man who has already won two Grand Tours. Contador will still hope to win this Tour, but he was badly found out today. Nibali, bold and aggressive, was superb on the cobbles. His Astana team, their light blue kits begrimed with mud washed down off the fields by the heavy rain, were united in their task and tactically cohesive, and they squeezed out every last watt for their leader. The Italian couldn’t quite win the stage against a rampant Lars Boom, who had dropped cobbles specialist Fabian Cancellara fair and square, but his third place, on the wheel of team-mate (and new dark horse for the top five), Jakob Fuglsang, was a throwback to the days when Grand Tour contenders could also shine in the Classics. “The Tour starts now,” tweeted Alberto Contador soon after the finish. That’s partially true – there are several mountain stages and a long time trial to come, and over two weeks of racing left. But while most of the GC contenders saw the first five days of the Tour as stages to survive and minimise losses, only Vincenzo Nibali has used them as opportunities to gain an advantage. He looks very comfortable in the yellow jersey, and his rivals are going to have a hard time getting him out of it. There was the start, and there was the results sheet. And in between, 194 different stories, one for each starter, hardly any of which will see the light of day. The rain fell incessantly on the bunch as they made their way from Ypres to Arenberg, and the fog of war descended on the peloton almost immediately. Things were happening at such a pace that it was difficult to keep up. Even before the cobbles, especially before the cobbles, crashes on slick corners and the stretching effect of bends and corners were undermining the peloton’s structural integrity. In this mining region, old mineshafts and tunnels occasionally collapse, leaving dents and holes in the landscape, a phenomenon given sporting tangibility in the constantly breaking and reforming bunch. The French describe a peloton like today’s as “nerveux”. It’s often translated into English as “nervous”, but the nuance is more along the lines of jitteriness than worry. There was little fluency about the bunch’s progress, with single files of riders slowing to almost walking pace as they followed an uncertain trajectory round the corners. A break of nine riders formed early, and it wasn’t the usual quartet-or-so of chancers, optimists and human advertising hoardings who usually fill the dead hours between the start of a stage and the inevitable bunch sprint. There was tactical reason and real ambition behind this break. 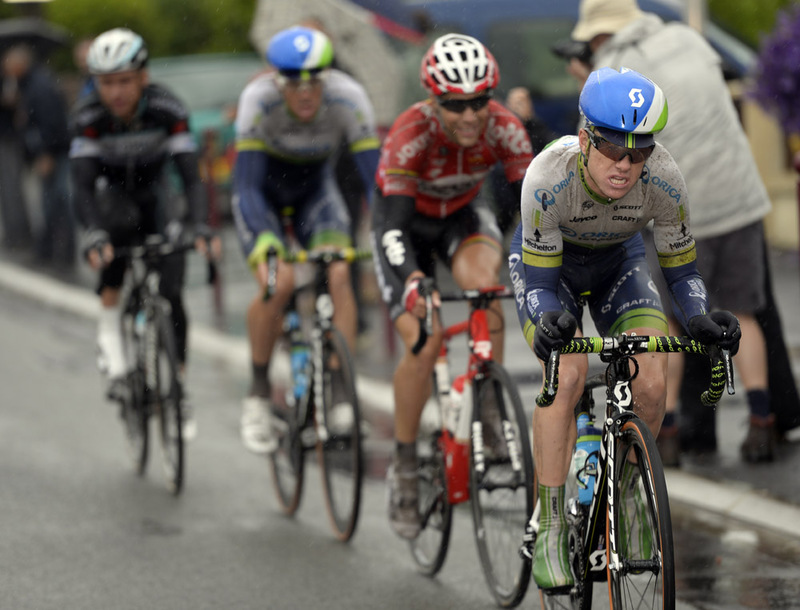 Mat Hayman and Simon Clarke both made it for Orica. Hayman’s a talented cobbles rider and stayer, and he was in the break to win the stage – with Clarke’s help, he could put himself well clear of the fight and crashes that would inevitably slow the peloton. Lieuwe Westra was there for Astana – if Nibali needed help at the front of the race, he’d be ideally placed to provide it. Marcus Burghardt of BMC, Tony Gallopin of Lotto and Javier Acevedo of Garmin would aim do the same for Tejay van Garderen, Jurgen Van den Broeck and Andrew Talansky respectively. Tony Martin of Omega Pharma would ensure that the break would stay away for a long time, and be there for Kwiatkowski for the overall, or perhaps Paris-Roubaix winner Niki Terpstra for the stage win. Samuel Dumoulin of Ag2r and Rein Taaramae of Cofidis were also along for the ride. Behind them, the crashes came. Froome went down, giving himself a set of nasty-looking grazes on his right side, to match those sustained yesterday on his left. Arnaud Demare crashed. A Giant rider crashed. Astana and Tinkoff moved gently to the front of the peloton, keeping their precious team leaders as safe as possible. And then Froome crashed again. At some point, between hitting the deck and standing up with his bike, the light in his eyes went out. Rumoured to be carrying a broken wrist, Froome simply stopped, there and then. For such a significant event, it was a curiously anticlimactic moment. One minute, Froome was the defending champion and Tour favourite. The next, he was an ordinary member of the public. While the television cameras lingered uneasily on his misery, the race went on without him, not looking back. 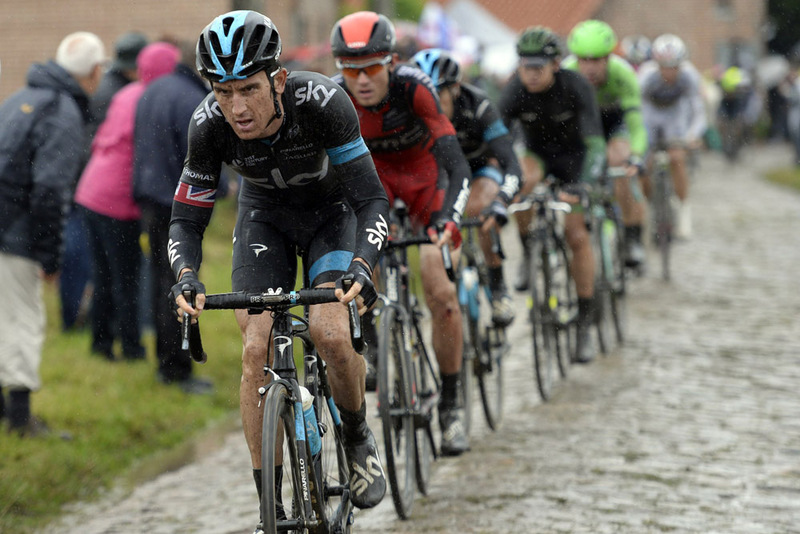 The key moment in the race came through the second section of cobbles, sector eight at Pont Thibaut. Lars Boom of Belkin, a flat track bully among the skinny climbers of the Tour, had stretched the peloton beyond breaking point, and suddenly, with 46 kilometres to go, the helicopter television shot showed a line of Astana riders on the front of a group of about 50 riders, and not a Tinkoff rider to be seen. Astana had identified their main enemy and were attacking him mercilessly. In just five kilometres, Nibali gained 30 seconds on Contador. The gap grew and grew. Westra and Fuglsang rode themselves into the ground for Nibali, ignoring the ongoing battle between Boom, Fabian Cancellara and Peter Sagan for the stage win. Boom sat on a surge by the Astana riders 12 kilometres out, then went round them in a solo bid to win. Cancellara and Sagan didn’t, or couldn’t follow, and the race settled into its final pattern: Boom, alone for the win; Fuglsang and Nibali in the process of engineering a coup; Sagan and Cancellara looking spent and disconsolate in fourth and fifth place; then a procession of survivors and GC favourites led in by their team-mates. Only Boom and Nibali could really describe stage five as a good day at the office. One won the stage, and the other might just have won the Tour. The records show that no rider has worn the yellow jersey from day two of the race to the end since Jacques Anquetil in 1961, and there’s a lot of difficult terrain to come, but Nibali has given himself a good start in trying to repeat the feat. For Contador, Valverde, van Garderen, Mollema, Talansky and the other yellow jersey favourites, the day was not disastrous, but neither did it go well. They have all conceded two minutes to a rider who has already won a Giro and Vuelta, and who is in his element in an open, attacking race. Sky came off worst. They have religiously stuck with Plan A for five Tours, and the score is now 3-2 against them. Richie Porte rode exceptionally well with Geraint Thomas to concede only 1-52 to Nibali, but the pressure is now on him to salvage their race. His form has been unpredictable this year, but then again, so has Nibali’s until this week. British fans will be disappointed that after only four home riders started the Tour in Yorkshire in front of those huge crowds, the two most famous, Froome and Mark Cavendish, have gone home. The rest of the Tour, and the British public’s interest in it, may give us a good indication of whether Britain fell in love with cycling, or with success.